Telerate no longer exists, having been taken over by Reuters in 2005, but in its day, Telerate was a pioneering and forever controversial leader in the distribution of real-time market information. Telerate began life as a two-man New York business founded by a twenty-something businessman named Neil Hirsch operating out of a small office above Penn Station. The secretary answering the telephone had to pretend to be several other people to give the impression that the company was bigger than it was. At first using money borrowed from his father, Neil Hirsh later attracted new investors, including Bernie Cantor, owner of a government securities broker called Cantor Fitzgerald. Telerate would later go public, becoming the first business of its kind to secure a stock exchange listing. (Reuters followed suit a year later.) By then, Telerate was playing a significant role in the development of the multi-billion dollar financial information industry, now dominated by Bloomberg and Thomson Reuters, specialising in data from the huge United States domestic money markets. 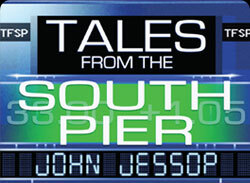 John Jessop, a senior executive of Telerate, recalls the company’s glory days in an amusing (and scandal-ridden) memoir called Tales from the South Pier. Telerate is an ideal subject for such a book. Founder Neil Hirsh was a colourful character with a hedonistic lifestyle that involved drugs and alcohol in quantities that some observers saw as life-threatening. Co-owner Bernie Cantor attracted much early controversy by using Telerate as a vehicle for advertising its trading prices, the first broker to do so, attracting the anger of many of its customers including such Wall Street giants as Merill Lynch, Bankers Trust and Chemical Bank. Telerate itself, in its early days, only narrowly avoided attracting newspaper headlines about the social antics of some of its senior executives. For all its excesses, the business grew rapidly, made indecent profits, and its public share offering made Neil Hirsch, along with some of his colleagues, multi-millionaires. When the Telerate business was taken over by Dow Jones in 1990, Telerate’s sales were on the way to one billion dollars, but the partying had to end. Dow Jones was a strait-laced organisation and as publisher of the Wall Street Journal, America’s leading business newspaper, was acutely conscious of its vulnerability to the risk of revelations of a potentially embarrassing nature. Tales from the South Pier recounts the rise of Reuters, Telerate and Bloomberg and other market data companies in an anecdotal style, from the perspective of an insider and with the perception of an eye-witness. Find out more about the author John Jessop.